Parents often feel helpless when their child is in pain. But imagine your child being more than 3,000 miles away in a foreign country with a badly broken leg. For the past several years, Becky Maks and her husband have accompanied their son Dillon on a week-long group mission trip to Peru through Hoops for Hope International, an organization that uses basketball as a tool to help children realize their own significance in the world. But this summer was different. Being quite an independent 16-year-old, Dillon was allowed to make this year’s trek without his parents. A few days into the trip, Mr. and Mrs. Maks received a call that Dillon was in the hospital. He had landed poorly after demonstrating a lay-up and broken his left leg. Mr. and Mrs. Maks immediately turned to McLane Children’s for help. Doctors in Temple began conferring about Dillon’s care with their counterparts in Peru who were reluctant to release him, fearing the long journey home would make things worse. 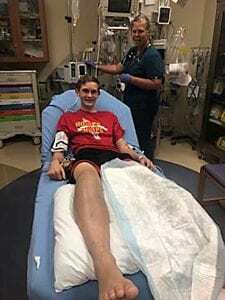 Finally, Dillon was on his way to Houston on a first-class flight due to the need for extra space to keep his leg immobilized. Their trust in McLane Children’s led the family to seek care closer to home rather than in Houston. After two days and 3,570 miles of travel, Dillon was relieved to see the McLane Children’s team waiting for him at the Emergency Center entrance. After a surgery to put three screws in his leg, Dillon is already back to playing basketball at Troy High School only two months later, and plans to return to Peru next year.